2014 ACERE Conference is well underway! You are here: Home / General / 2014 ACERE Conference is well underway! 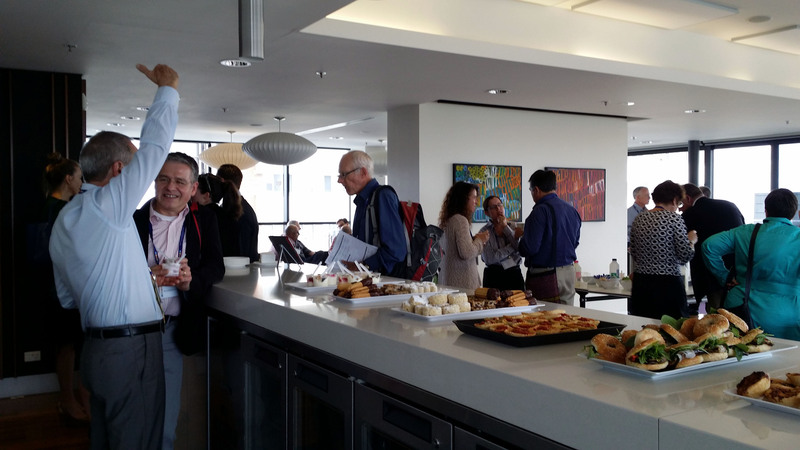 The 2014 ACERE Conference is well underway, with thanks to UNSW and The Australian School of Business, delegates have enjoyed uninterrupted views, a wide open space for collaboration and idea generation. This morning’s welcome by Per Davidsson inspired delegates to take advantage of the developmental opportunities forthcoming at the Conference. A special entrepreneurship presentation by Emeritus Professor Murray Gillin was informative, and demonstrated the growth of the conference over the past 10 years, and entrepreneurial research in Australia and New Zealand. Emeritus Professor Gillin’s speech can be read here. The PDS pitching and paper development sessions have been well received, with delegates continuing discussion and debate around the watering hole. Coming in to day 2, delegates will have the opportunity to participate in a specially designed workshop by Suresh Kumar – Founder & Executive Chairman, NexAge Technologies USA Inc.
To read more about this workshop click here. This workshop will feature a series of vignettes by expert entrepreneurs, researchers, and policy makers that showcases academic-practice bridging strategies that have worked. Attendees will have the opportunity to network with others who are eager to pursue tangible, productive projects and research and perhaps even join a community of practice that extends well beyond a few PDWs. We invite the participants to join our current and ongoing efforts to a vibrant international community around the idea of collaboration (http://gamechangenow.org/). This evening’s social networking function will be an excellent opportunity for delegates to socialise and further discuss and debate a wide variety of specialisations in the advancement of entrepreneurship in Australia and New Zealand.